England's classrooms need more male teachers, an education charity says, as government figures show a continued gender gap in the profession. Department for Education statistics show 26% of teachers in England are men - accounting for 38% of secondary and 15% of primary school teachers. 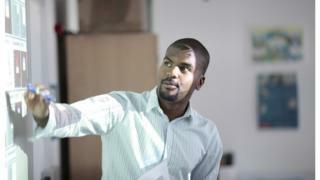 To mark World Teachers' Day, the charity Teach First is urging more men to consider a career in the sector. It says the profession should reflect the make-up of the classroom. Teach First, which recruits and places top graduates in schools serving low-income communities, to tackle inequality, says the lack of men entering the profession has resulted in an untapped resource. It says children and young people need access to committed, talented and knowledgeable individuals from a range of backgrounds. Jack Green, a second year Teach First participant teaching at a primary school in East London, says working in a female-dominated profession has not put him off. "I am extremely lucky to have worked in a school full of experienced, professional and supportive female staff members. "The issue is not with the amount of women in the job, it is the lack of males who are motivated to want to teach. "My main motivation in joining the profession was to be a positive role model to children in any school I work in. "Unfortunately, a huge part of the inequality facing our country at the moment is that many children are left without a positive male role model at home. "Having the opportunity to be that role model continues to motivate me on a daily basis. "In terms of recruiting males specifically, we need more positive male teaching role models to help dispel some of the myths about teaching and show what a challenging and rewarding career it is." Brett Wigdortz, founder and chief executive of Teach First, said: "It is a real loss that the profession is missing out on talented classroom leaders because a huge pool of people are being put off by misconceptions about teaching. "Young people need role models from all backgrounds to unlock their potential and aspiration, and to help them understand the world. "Teaching is a hugely rewarding job, where you not only make a real difference to the lives of young people who need it most but also boost your own skills and development." A Department for Education spokeswoman said: "We welcome this drive from Teach First to encourage more men into a career in teaching. "Our priority is getting the brightest and the best teachers into our classrooms, including male staff at all levels. "That is why we are spending millions of pounds on recruiting high-quality teachers. "We can be proud of the fact that teaching is an increasingly popular profession, with more young men and women embracing the opportunity to inspire and shape the lives of the next generation."